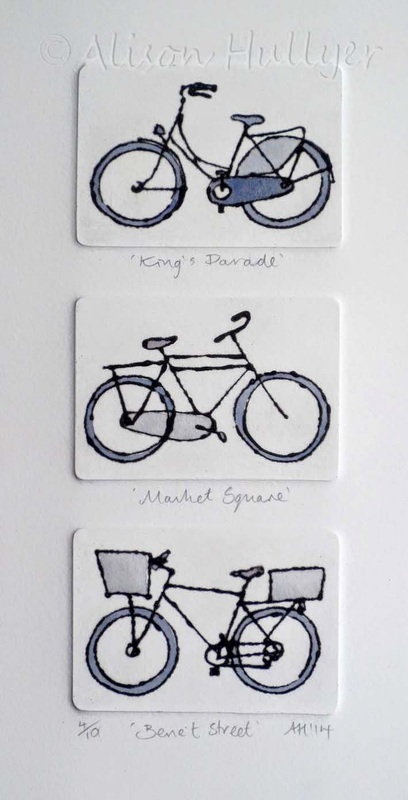 As I have been in a bicycle frame of mind recently I have also produced this little set of Bike drypoint prints. 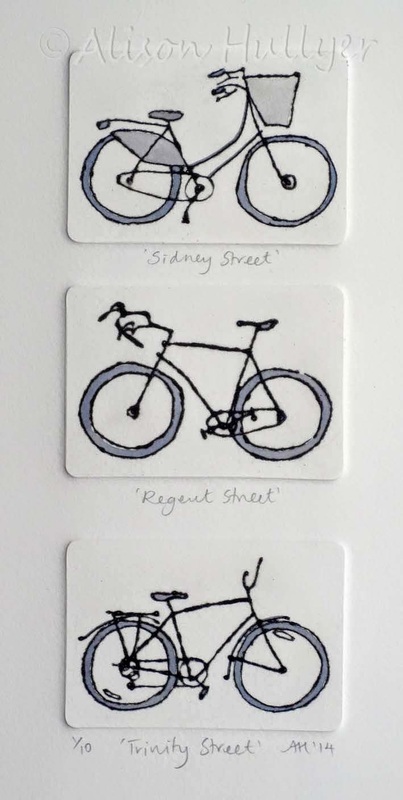 They are named after the streets where I sketched them in Cambridge. 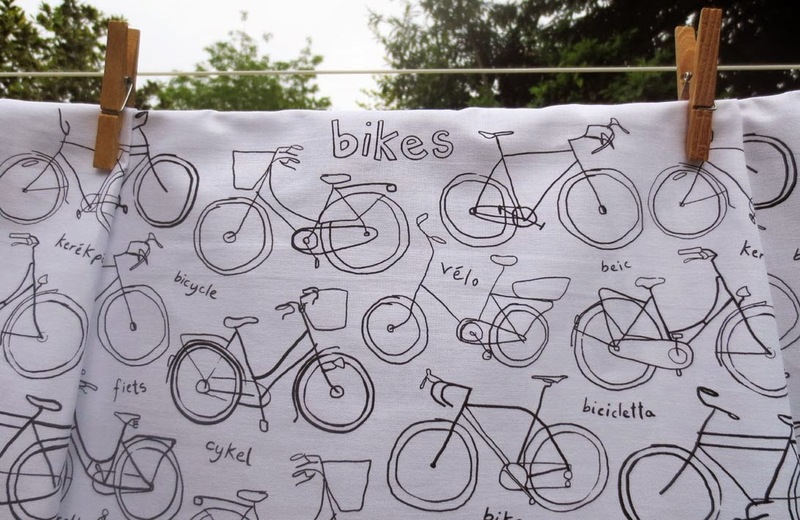 I am open to commissions of your own bikes and can make a 'family group' if required. Please contact me for more details. Today I received delivery of my brand new tea towel design. 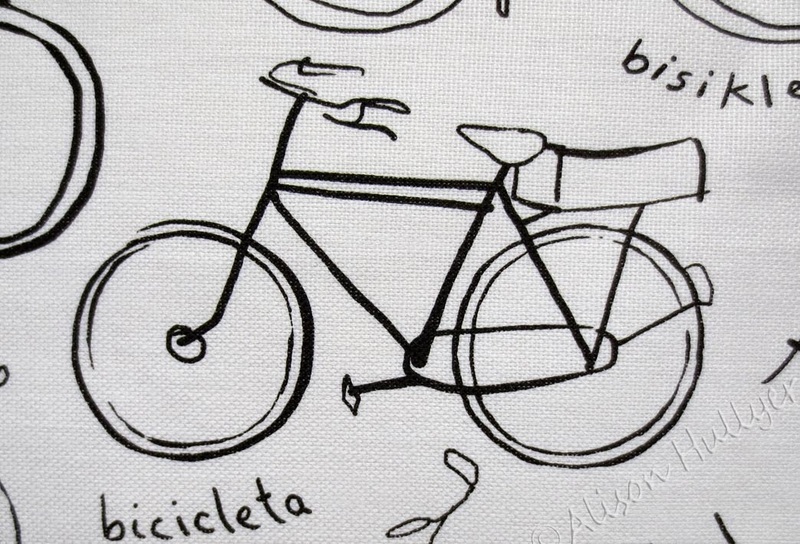 Having lived in Cambridge all my life, apart from three years at college in Newcastle, I decided to design a bike themed tea towel. The Tour de France is coming through the city on 7th July, so I thought this was an ideal time to get sketching. Bikes are everywhere in Cambridge and it wasn't until I started drawing them I realised they come in so many shapes and sizes. I've also tried to reflect the great many overseas visitors that visit our wonderful city every year, by including the word for bicycle in twenty different languages. 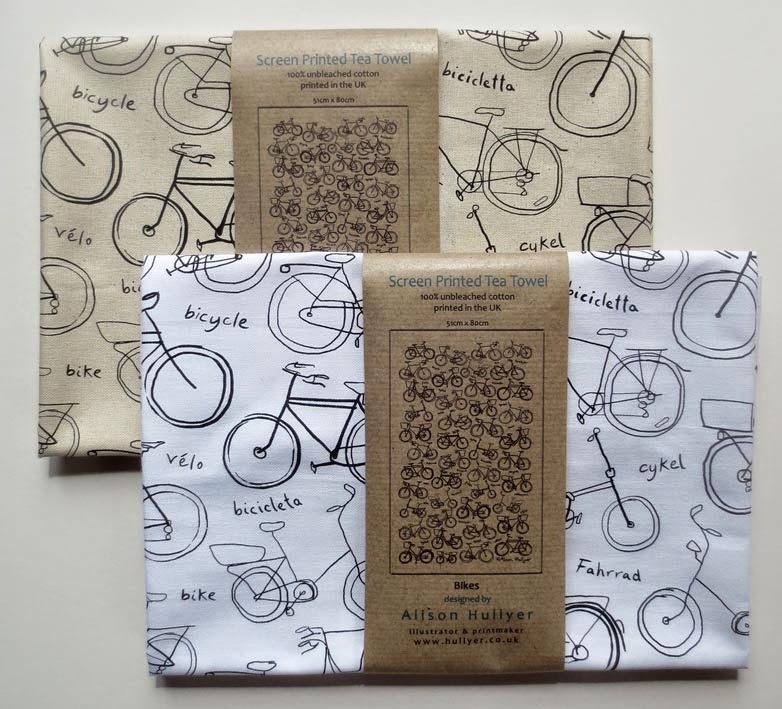 They are currently at a special introductory price of £9 on my website and there is a choice of black on unbleached (cream) cotton or bright white cotton. I have been very lucky and had a great commission from Phoenix Trading for a great range of cards. The 30 and 40 came out in January and now I have added to the range. So there are now special 6" x 6" cards for those big age milestones. 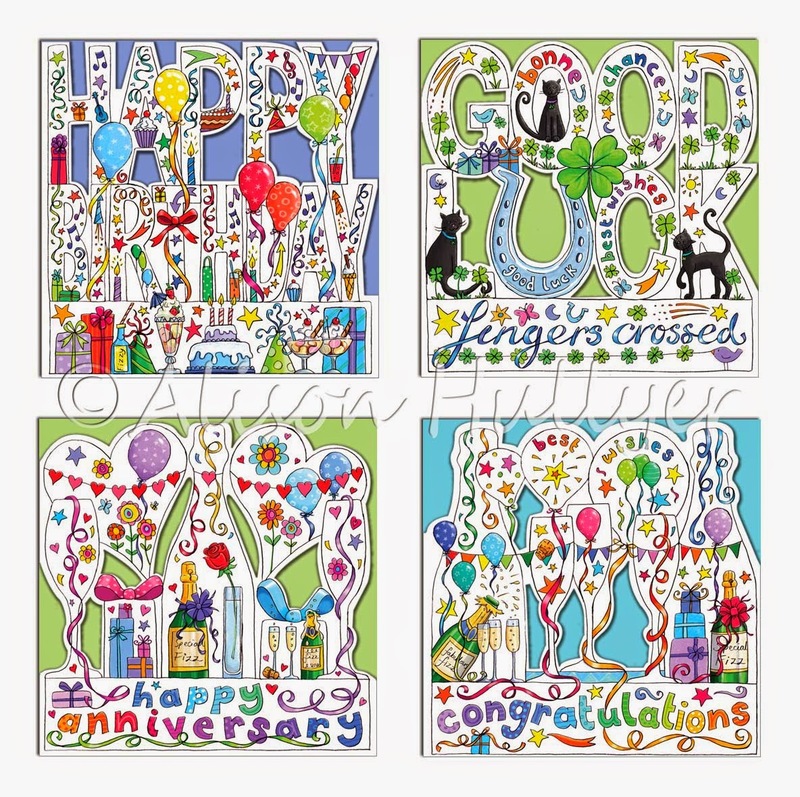 They also asked me to produce similar die-cut designs for a general Happy Birthday, Good Luck, Happy Anniversary and Congratulations. 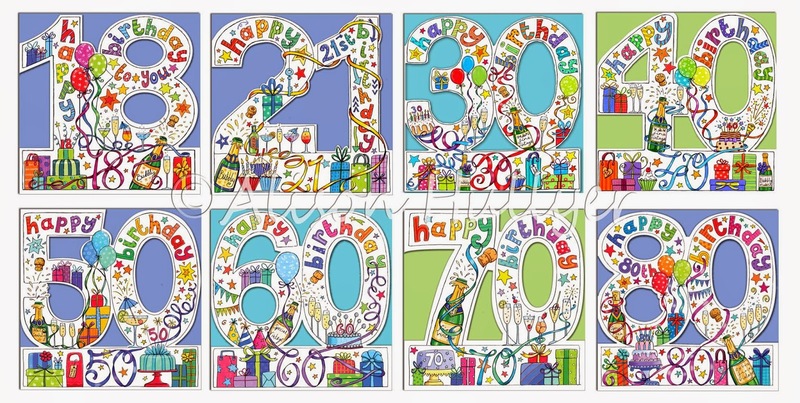 As well as being die-cut they are also glossy, have embossed detail, are flittered and come with coloured polka dot envelopes, all that and only £2 from your local Trader.